This Valentine’s Day, make sure you’re giving back to those who help make your life easier on a daily basis. In addition to your family and friends, there’s one other thing that does that as well — your car! Every now and again, your car needs a little TLC to get running to its optimal performance. 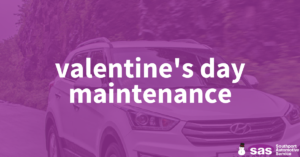 This holiday, show some love to your car by bringing it into a shop for these pieces of maintenance! From oil to washer fluid, there are a number that flow through the lines of your car on a daily basis, and they’re all vital! To make sure your car is running how it should be, make sure to have these fluids inspected, topped off, or changed as necessary. As the winter draws closer to an end (finally!) it’s time to think about putting a fresh set of tires on your car before the season begins. Have your tread checked and tires inspected for dry rot before you set out on another adventure! One of the last things you need is a dead battery on a cold morning. If your battery is running low on juice or simply doesn’t have enough CCA (Cold cranking amps) to power the car, it might be time for an upgrade! Of course, winter can be detrimental to a number of other factors of your car, so it’s important to have all of it checked before a problem really gets in your way.